Alicia Alonso as she appeared in the American Ballet Theatre production of “Swan Lake,” circa 1945. She recalls her illustrious career with ABT in AMERICAN BALLET THEATRE: A HISTORY. Photo: Maurice Seymour. Produced and directed by Ric Burns for THIRTEEN PRODUCTIONS LLC for WNET, American Ballet Theatre: A History celebrates the 75th anniversary of American Ballet Theatre (ABT) and will stream at http://pbs.org/americanmasters beginning on May 16, 2015. A must-see for ballet aficionados, educators and students, the film is an archival treasure for American Ballet Theatre scholars and fans, as well as a sure-fire ABT fund-raiser. Launched in the fall of 1939 and guided to greatness under the visionary direction of Lucia Chase and Oliver Smith (1940-80), American Ballet Theatre proudly wears the mantle as “the only major cultural institution that annually tours the United States.” It has appeared in all 50 states and also made more than 30 international tours to 50 countries. On April 27, 2006, ABT was named America’s National Ballet Company® by an act of Congress. American Ballet Theatre’s Corps de Ballet perform “La Bayadère” in AMERICAN BALLET THEATRE: A HISTORY. Photo: Buddy Squires, ASC. It’s not easy to engage audiences with filmed dance performances. Visionary cinematographers, however, have been known to take the most esoteric subject matter and broaden its appeal. Buddy Squires, ASC, is one such cinematographer. Squires has put his stamp on a boatload of Emmy and Academy Award winners and nominees, including many films by Ric’s brother, Ken Burns. The exquisite footage shot by Squires and his 30-person crew for this film using Phantom Flex cameras manages to zero in on the delicate beauty of the ballet movements without losing sight of ballet’s underlying athleticism and the importance of costuming and music to the experience of watching ballet in live performance. 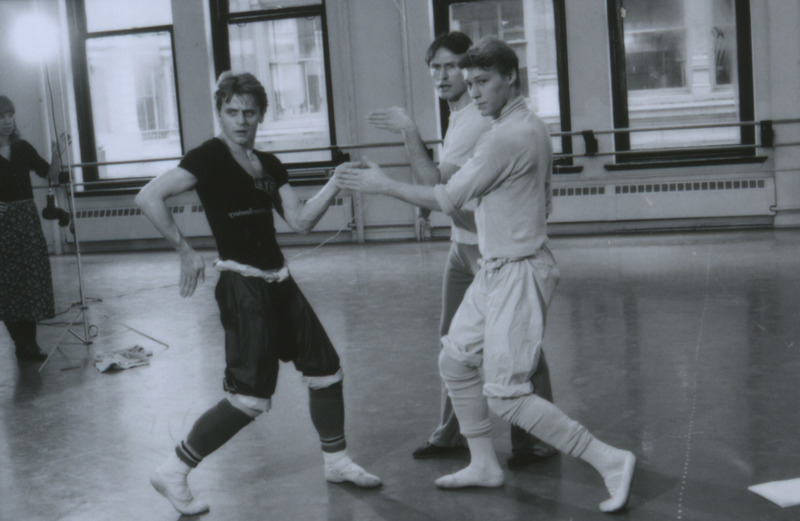 American Ballet Theatre principal dancer and Artistic Director Mikhail Baryshnikov and Robert La Fosse (right) rehearsing with choreographer John McFall (center) in McFall’s ballet “Follow the Fleet,” in 1983. Photo: MIRA. Director Ric Burns combines this recently shot ABT performance footage (from 2006 to present) with rare archival performance and interview footage and stills, as well as extensive interviews with past and present ABT dancers, choreographers and administrators to chart ABT’s storied past and celebratory present. ABT’s survival is nothing short of miraculous given the spirit-deflating challenges faced by cultural institutions over the past 75 years. 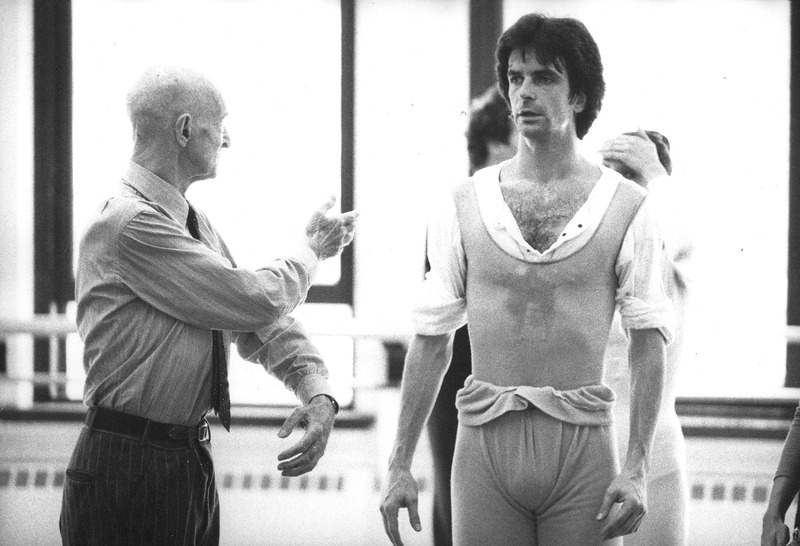 Choreographer Antony Tudor (left) coaching American Ballet Theatre dancer Kevin McKenzie in Tudor’s ballet “Jardin aux Lilas,” circa 1986. Photo: Paul B. Goode. Aside from the archival and recently filmed performance footage, I also found the interview clips (some archival) to be informative and fascinating, most especially with ABT founding member and co-director Lucia Chase; charter member and choreographer Agnes de Mille; dancer Alicia Alonso; dancer and current ABT Artistic Director Kevin McKenzie; founding member and dancer Donald Saddler; and choreographer and associate director Antony Tudor. Unfortunately, the film sags appreciably during the info-saturated segments featuring dance historians and critics Jennifer Homans and the late Clive Barnes. And while the exquisite camerawork by Buddy Squires and his crew is a major asset overall, the artful over-use of slow-motion to accentuate the tiniest ballet movements grows tedious. 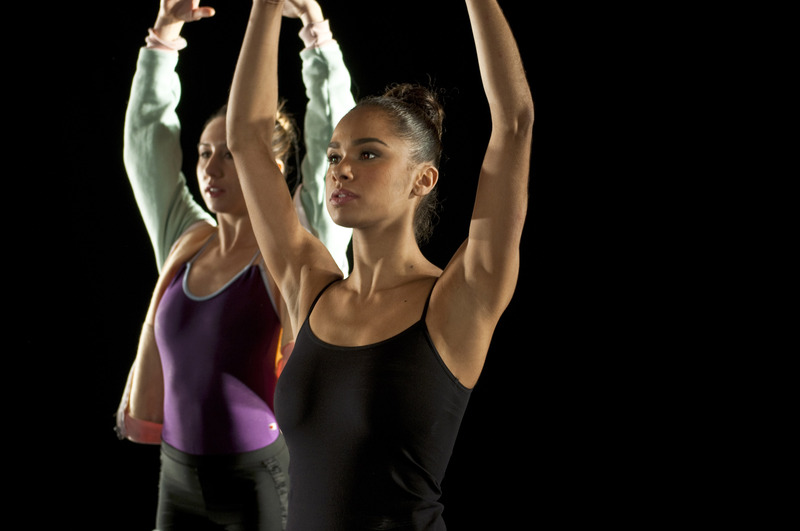 American Ballet Theatre dancers, from left: Isabella Boylston and Misty Copeland, during the shoot for AMERICAN BALLET THEATRE: A HISTORY. Photo: George Seminara. These drawbacks and the film’s extended length may limit general audience appeal, but will not affect the film’s long-term value to students, teachers, archivists and fans of the ballet and ABT. American Ballet Theatre: A History is an evergreen asset to the ABT repertoire and smartly launches ABT’s 75th anniversary spring season (continuing through July 4) at NYC’s Metropolitan Opera House. This entry was posted in Dance, Film, Theater, Theatre, TV and tagged Agnes de Mille, Alicia Alonso, American Ballet Theatre, American Ballet Theatre: A History, American Masters, Antony Tudor, Ballet, Dance & Dancers, Lucia Chase, Mikhail Baryshnikov, Misty Copeland, Ric Burns. Bookmark the permalink.